I have a whole weekend off! Now, what does that mean? When I'm not teaching we usually spend the weekend visiting shows or colleges/courses with Winifred Cottage. As I said, last weekend we were at Textiles in Focus. I have spent the week beginning to restock our supplies, and a 'weekend off' means that that will continue! There are also three wholesale orders for Sassa Lynne that need attention, so the dyepot is red hot and I am working away with colour. Specific orders mean no time for experimentation, named colours are mostly the order of the day, but as I need still more Embellisher Rolls with the vegetarian silk I'm having fun with those too. I will also pop some yarns into some Serendipity pots, these are the experimental ones that will eventually make their way into the named range. I did take an hour off this morning, though! I went to visit our newest grandson. He is now 6 months old and growing apace. We had lots of smiles and giggles amongst the hugs, so I've now had my 'fix' for a few days. We will see him again next weekend when we babysit for an evening while his Mum and Dad go out for a meal. 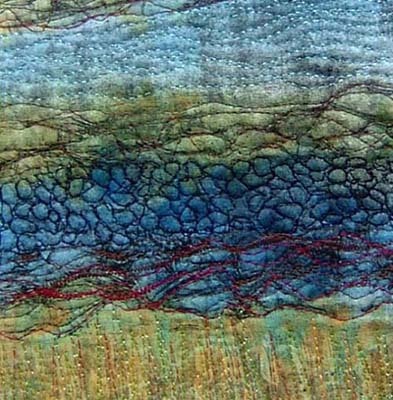 It will be a busy week with trips to Heather Quilters, where I'm speaking about the Embellisher, Urchfont Manor and also the Quilters' Day at Selsey. If you are passing the stand - don't forget to say 'hello'. As far as Urchfont Manor is concerned - there is a very good exhibition of Art in the Garden that is well worth a visit.